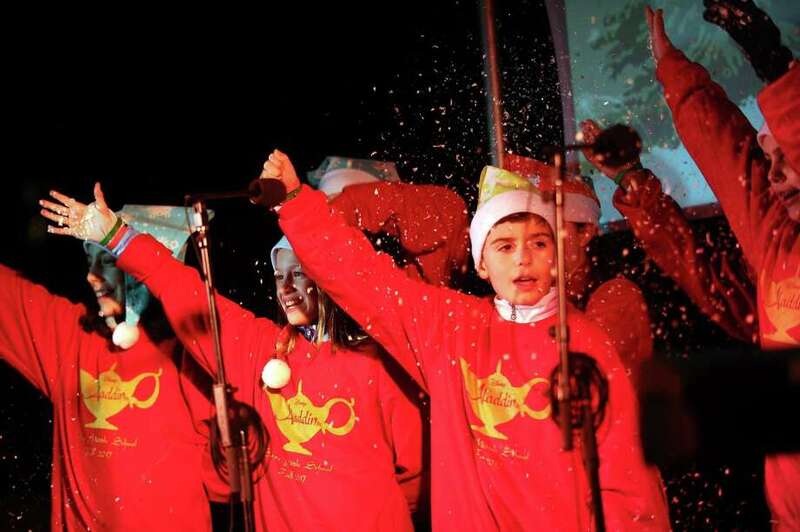 The cast of Aladdin Jr. from Saxe Middle School, in New Canaan, Conn., sing a carol during the annual Heights & Lights event in downtown Stamford, Conn. on Sunday, Dec. 3, 2017.
was transformed by performers and festively-dressed partygoers Oct. 27, as the Young Women’s League of New Canaan hosted Cirque Noir. Over $20,000 was raised as attendees were dazzled by acrobats, dancers and mentalists. The featured beneficiary was CIRI (Connecticut Institute for Refugees and Immigrants), which provides high-quality legal, social and educational programming to asylum seekers and victims of human trafficking. The YWL grant will support the Survivor Services program, which directly benefits those who have suffered torture, human trafficking, and other human rights violations. The rest of money raised went into the YLW’s Giving Fund to be distributed next year. Sponsors of this event include New Country Porsche of Greenwich, Ashley Howell Petraska of Berkshire Hathaway, Go Figure Barre Studios, Peter Suchy Jewelers, Jaafar Tazi Salon, Jennifer Anderson Design + Development, and Mitchells. In honor of its 50th anniversary, the New Canaan Scholarship Foundation (NCSF) began accepting named and endowed scholarships, established in honor of an individual, group, organization or business. In only one year, NCSF received 15 new named and endowed scholarships, to add to its founding scholarships, The Henry S. Coleman Endowed Scholarship, in honor of NCSF founder Henry Coleman, and the Bradley J. Fetchet 9/11 Memorial Foundation Endowed Scholarship, in honor of Bradley Fetchet, a New Canaan High School (NCHS) graduate who perished in the World Trade Center on Sept. 11, 2001. The John Leslie Endowed Scholarship, in honor of John Leslie, a member of the class of 2012 who died in August 2007. The Peter Myers Endowed Scholarship, in honor of Peter Myers, who died in 1972 prior to graduating with his class in June 1973. The Martha Gaines Wehrle Endowed Scholarship, in honor of Martha Gaines Werhle, who pioneered a path for women in state politics and showed her family each and every day the power and importance of leadership, education, and hard work. The Ben Young Endowed Scholarship, in honor of Ben Young, a beloved Saxe Middle School teacher and NCHS boys tennis coach. The Briar Foundation Endowed Scholarship, meant to help a deserving NCHS graduate who relies on financial aid to assist with college expenses. The Kelsey Durkin Endowed Scholarship, in honor of Kelsey Durkin, a NCHS graduate of the class of 2010 whose life was cut short by a drunk driver while she was a student at Washington and Lee University. The Jack and Jennifer Murphy Endowed Scholarship. The Class of 1977 Endowed Scholarship, in memory of their classmates who have passed away since graduation. This scholarship is accepting ongoing donations. The Myledred F. Marcely Scholarship Fund, in honor of Myledred F. Marcely, a former ceramics teacher at NCHS in the building that is now known as Saxe Middle School. The Bigger, Not Smaller Scholarship, founded by Preston and Kim Bealle in honor of their friend Claire O’Hare. The Cioffi Family Scholarship, to assist a student who has demonstrated interest and enthusiasm for the inclusion of all students within the high school setting but, in particular, those who have special needs. As college tuitions continue to increase, there is a significant need for scholarship funding within New Canaan. The cost of education is accelerating and the needs of all applicants cannot be fully met. In 2017, NCSF received over 60 applications. Of these, the NCSF awarded 54 students a total of $83,500, or less than $2,000 each. It is the goal of NCSF to continue to increase fundraising in order to ensure that the foundation can provide aid to every deserving applicant and increase the amount of each scholarship. NCSF’s endowment currently totals $192,000, or approximately $800,000 less than the endowment in neighboring towns. The goal is to raise over $1,000,000 in order to grow their endowment and have ample funds under management to further assist students in need. Named Endowed Awards, totaling $22,500 or more, designed to last in perpetuity or for a designated period of time. General scholarship donations in any amount. Donations can be made online at nchs-sf.org or by mail at NCHS Scholarship Foundation, New Canaan High School, 11 Farm Road, New Canaan, CT 06840. Make checks payable to New Canaan High School Scholarship Foundation. New Canaan Country School’s fifth and sixth grades headed to a theater in downtown Wilton recently to see one of the first showings of ‘Wonder,’ a movie based on the bestselling young adult novel by R.J. Palacio. Wonder tells the story of August Pullman, a boy with facial differences who enters fifth grade, attending a mainstream elementary school for the first time. The movie presents themes of kindness, friendship and acceptance. The Middle School first read ‘Wonder’ when it came out five years ago, and it has been a choice book for the summer reading for the past several years. Through book discussions, students have explored their own identities and what it means to be a good friend.